CONSUMER ELECTRONICS SHOW 2007, LAS VEGAS – January 5, 2007 – Consumers' ability to store video, photos, music and other valued data will reach new heights as Hitachi Global Storage Technologies today announced the industry's first terabyte (TB) hard drive. Delivering superior performance and reliability, as well as capacity, Hitachi's 1TB hard drive meets the needs of consumers who want to create, share and store their digital information, and lots of it. Hitachi's Deskstar® 7K1000 will begin shipping to retail customers in the first quarter of 2007 at a suggested retail price of $399 (USD), or 40 cents per gigabyte (GB). This new consumer-friendly price makes ultra-high storage capacity more affordable and accessible than ever before. Along with the Deskstar 7K1000 for the retail market, Hitachi is also announcing today a CinemaStar version 1TB hard drive, which provides optimized capabilities specifically designed for digital video recording (DVR) applications. Consumers have come to rely on their digital video recorders (DVRs) to record and store their favorite programs, and with the increasing availability of high-definition (HD) TV programming, 1TB of storage will become a necessity. High-definition video requires 4 to 5 times more storage capacity than standard-definition video and a terabyte drive allows viewers to easily store and retrieve almost 250 hours of HD programming (additional storage facts can be found in the accompanying press release addendum). "The industry's first one-terabyte hard drive represents a milestone that is 50 years in the making, and it reasserts the hard drive's leadership as the highest-capacity, lowest-cost storage technology," said Shinjiro Iwata, chief marketing officer, Hitachi Global Storage Technologies. "In the 51 st year, Hitachi is leading a new era for hard drives -- not only providing large amounts of affordable storage, but also customizing and optimizing hard drives to deliver products that are smarter, more durable and more useful to the consumer." Consumers have entered an era where everything they capture on digital still or video, listen to and write, can be saved and shared for future enjoyment. In the connected home, storage becomes the epicenter of the home network, linking the living room, the office and the bedroom together in a truly digitally-connected home. The family's games, home movies, photos and music can be stored and accessed from a variety of digital entertainment devices within the home. As the distribution of video content to social networking sites and to handheld devices becomes more commonplace, storage capacity requirements will reach new heights. In this scenario, consumers can begin to imagine what they would do with all that capacity. With 1TB, Hitachi's Deskstar 7K1000, for PCs and home media centers and the CinemaStar 7K1000 for DVRs help to usher in this new era. Hitachi's 1TB products deliver the performance and reliability required for the digital lifestyle. 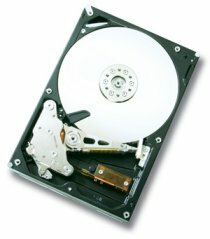 The 3.5-inch, 7200 RPM Parallel-ATA/Serial-ATA hard drives are built on the industry's most reliable perpendicular magnetic recording technology, first established with Hitachi's Travelstar 2.5-inch and 1.8-inch product lines. "Consumers who increasingly rely on hard disk drives to store their digital memories are seeking higher capacity and more reliable HDDs," said John Rydning, research manager for hard disk drives at IDC. "Reaching 1 TB of capacity in a disk drive is a testament to 50 years of innovation by the hard disk drive industry, and helps to ensure sufficient storage capacity is available to meet increasing consumer storage requirements." Finally, an enterprise version of the TB drive designed for lower duty-cycle, high-capacity enterprise environments is currently under evaluation at major OEM customers and is expected to be available in the second quarter. The Deskstar 7K1000 SATA version will be available in Q1 2007 at 750-GB and one-TB capacities. The 1TB capacity point will have a suggested retail price of $399 (USD). The CinemaStar 1TB hard drive will be available in the second quarter.